This article is about the city in Colombia. For the country, see Armenia. For other uses, see Armenia (disambiguation). 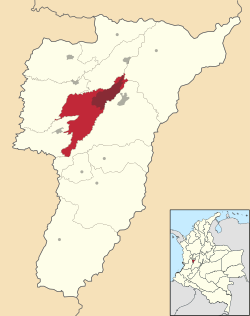 Armenia (Spanish pronunciation: [aɾˈme.nja]) is the capital of Quindio Department. It is one of the main centers of the national economy and of the Colombian coffee growing axis. 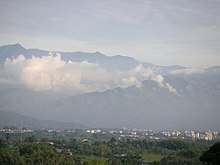 Armenia is a medium-sized city and part of the "coffee triangle" with Pereira and Manizales. The city was founded on October 14, 1889, by Jesús María Ocampo, also known as "Tigrero" (translates to "tiger killer") due to his love of hunting jaguars, known locally as tigers. Ocampo came from Anaime, Tolima, looking for shelter in the mountains of Quindío because he was running away from General Gallo. 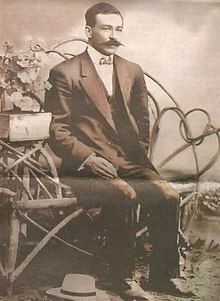 He paid one hundred pesos in gold coins to Antonio Herrera for the land on which to build a fonda, or trade center, not only for himself but also for other colonists who came from Salento, Antioquia, Manizales, and areas surrounding the Quindío River and La Vieja River. Ocampo then proceeded to sell land for settlement. To encourage settlement, Ocampo returned to Anaime to ask for the help of his friend Juan de la Cruz Cardona and to marry thirteen-year-old Arsenia Cardona. Six months after its founding, in August 1890, Armenia had reached a population of 100 people, allowing it to gain legal recognition by the government. The city was initially called Villa Holguín, in honor of Carlos Holguín Mallarino, the then-current president of the country. It is believed that the name was changed to Armenia after the country of the same name, in memory of the Armenian people murdered by the Turkish Ottomans in the Hamidian Massacres of 1894–97 and later the Armenian Genocide of 1915–23. It is also known by its nickname, "Ciudad Milagro" (Miracle city). Despite Armenia's quickly expanding economy at the time, the means of transport were still very limited. The main form of transporting people and merchandise was by mule, due to the mountainous terrain surrounding the city. It was not until the construction of the first asphalt road—in 1927 to Zarzal in the Department of Valle del Cauca—that transport was improved. 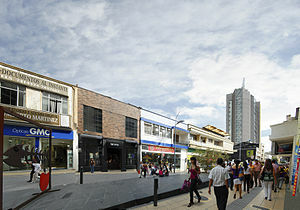 Nowadays, the city combines its contemporary development with all of the traditional ways of its forefathers' heritage, like the historic Liberator Pathway, the path used by Colombia's 19th century liberator Simon Bolívar to move his army between the west of the country and Santa Fe de Bogotá during his successful independence campaign from Spain, currently one of the top-two tourist destinations in Colombia. Due to its namesake, many Armenian tourists also visit the city. It is estimated that a large earthquake, approximately 6–7 in magnitude, will hit this area every 20 years due to high seismic activity. It can be explained by the Galapagos Triple Junction, which is located at the northwest corner of the South American Plate where the Nazca, Cocos, and Pacific plates converge. Due to the link with the country Armenia, a memorial for the victims of the Armenian Genocide was built in the city. This is the only Armenian Genocide memorial in Colombia. The city of Armenia is located 290 kilometers southwest of Bogotá at a height of 1,483 m., Geographical coordinates, the following: 4.3270° north latitude 75.4120° west longitude. It has an area of 121 km2 (47 sq mi). It limits the north with the municipalities of Circasia and Salento, west to the town of Montenegro, east to the town of Calarcá and south with the municipality of La Tebaida. Armenia is situated close to the center Cordillera about 35 km (22 mi) from the top of the line. The climate of the city of Armenia is varied, the average temperature ranges between 18–23 °C (64–73 °F). Armenia is often referred to as "Ciudad Milagro" (Miracle City) due to its fast urban growth and development. The city center includes a nine block pedestrian walkway, lined by shops and restaurants, through the center of the city and connecting two of the city's plazas. The local economy main trade is still based on the production of coffee, plantains, and bananas. To the south of the city as it gets closer to sea level, the temperature favors not only Quindio's agricultural economy, but a renewed tourist industry in the shape of villas for rent, theme parks, eco-hotels and family day leisure centers, not excluding all-time favorites like local cuisine restaurants, exhibition centers and country clubs specializing in fishing, tennis, golf, cart racing and other sports. Many traditional plantations still exist in the surrounding area and many offer bed and breakfast accommodation and "ecotourism" packages. The city has a modern international airport El Edén International Airport with daily links to Bogotá, Cartagena de Indias, Medellín and Fort Lauderdale which make the city a convenient choice for conferences, meetings, business and social events. El Edén International Airport is nearby. The renewed tourist industry has activated the popularity of the city and its surrounding areas. The region's northern area is the gateway to Los Nevados national park, where the highest peaks in central Colombia rise to perpetual snows at more than 4,500 metres. At the Quindio side of the foothills of this national park, lies the Cocora Valley, where the National Tree of Colombia, the wax palm grows, and whose municipality of Salento is a tourist destination known for its culinary delicacy (fried river trout), for its guadua crafts and furniture (the strong native bamboo cane), its art galleries and its position as a bohemian centre of regional artists. Tourists and hikers walk from here to reach the views of the park. The Chapoleras beauty pageant, with costumes depicting the traditional coffee harvesting dress in the fashion of late 19th century, and the various dances, is known in the entire country. Wikivoyage has a travel guide for Armenia (Colombia). Wikimedia Commons has media related to Armenia, Colombia.